Rev up your promotions with this 13-month appointment custom calendar. 18 Colors to choose from! Keep important documents organized and protected with the Automotive Vinyl Custom Wallet! Features 2 business card slots that allows you to keep your contact info at your fingertips. Fact-filled fold-up promotional guide to interesting and informative topics about automotive maintenance. This promotional pen set comes with a pocket notebook with matching color custom pen and both can be imprinted with your logo. Now that's a deal. The Mini Custom Tire Gauge w/ Keychain is a multi-purpose item which helps with both your car and your keys. A logo flashlight with a magnet that will free up hands to work on those important tasks. These aluminum customized keychains are imprinted using a photo anodizing process that creates a smooth imprint that resists cleaning or rubbing off. A logo stress ball is the right promotional tool to increase your sales. 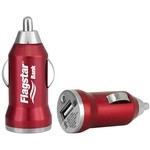 ePromos has a great selection of promotional items for the automotive service & repair industry! Give your clients the tools to fix little problems with promotional tool kits and imprinted tools featuring your company logo. Promotional magnets make your contact information handy for the big problems that require your service and expertise. 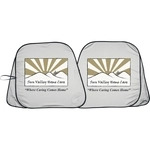 Logo car air fresheners will keep their cars fresh after a repair and keep you fresh in their minds!